So many cords and threads to choose from! How do you choose? While many cords and threads have can be used interchangeably, it is important to know why some threads work better than others. It may be due to the medium you are using (stones, metal, seed beads, etc.) or because of the method (multiple passes, weaving, straight stringing.) I will be talking about many different stringing media in this and future articles. Silk – Silk is mainly used for knotting pearls and gemstones. It is soft and strong, and comes in a variety of colors and diameters. The thinnest diameter is 00 (.005mm/.127”) and the thickest is FFF (.0165mm/.419”.) Silk is sleek and knots beautifully. If you are knotting pearls, you want to use silk, never a synthetic thread. Silk can be dyed to make any color you want. Simply put a few grains of RIT dye in a cup with boiling water and dip your white silk until you reach the color saturation you wish. Rinse well. Dyes can be mixed for custom colors as well. Silk can be purchased in bulk spools, or pre-carded with a needle. I often use two different colored strands of silk to enhance the beads I’m knotting – for instance, one peach and one olive with unakite, one sage green and one lavender with lapis Nevada. Silk can also be used in kumihimo or in Chinese braiding and knotting. You can make a self-needle out of silk by using gum arabic beading glue to stiffen the ends. German beadsilk generally is more “twisty” which works well in a “Tin Cup” style necklace, where there are distances of silk between the beads. Chinese silk has less of a rope-like appearance and knots well. You can use silk thread with French wire for a professional look, or hide the cord knot with a clamshell tip. One last note: In an earlier post I spoke about Gudebrod silk thread. Sadly, Gudebrod has gone out of business. 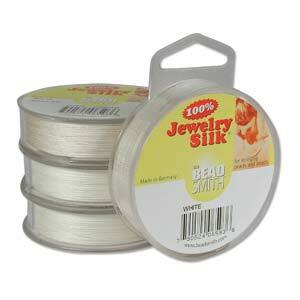 For silk thread, Beadsmith has both the German and the Chinese thread, both are very high quality.